NEW ORLEANS –With the bulk of the NCAA Division I conference championships set to take place this weekend, this past weekend did not see a ton of track & field action. 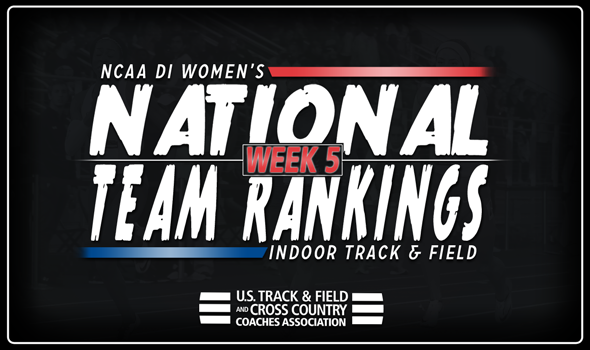 The rankings definitely reflected that, as the top-nine teams in the newest batch of the NCAA Division I Women’s National Team Rankings held their spots in top-25 from a week ago, announced the U.S. Track & Field and Cross Country Coaches Association (USTFCCCA) on Monday. The only new team in the top-10 this week was Minnesota, who jumped up one spot to 10th. The Golden Gophers saw three weight throwers in Kaitlyn Long, Agnes Esser and Nayoka Clunis hit top-10 Descending Order List marks at the Parent’s Day Invitational over the weekend, giving the squad the boost it needed to return to the top-10 after falling out last week. Arkansas, Southern California, Kentucky, Georgia and Oregon remained in first through fifth, respectively, after a light week of work. The Razorbacks distance medley relay team ran an 11:02.31, good for ninth in NCAA Division I this year, at the Alex Wilson Invitational. But other than that performance, there were no other top-10 NCAA Division I Descending Order List marks by any of the top-five teams on the weekend. The same can be said for the most part for spots six through nine, as well. LSU (sixth), Florida (eighth) and Stanford (ninth) were all relatively quiet on the week. Only Texas A&M (seventh) saw a top-10 Descending Order List mark hit over the weekend, when the Aggie’s distance medley relay ran an 11:03.10 at the Alex Wilson Invitational. There was a little movement just outside of the top-10 with Missouri and Kansas both moving up to 12th and 13th, respectively. The Tigers continued its gradual climb, as this marks the third straight week of moving up in the rankings. The Jayhawks relay squads provided the program with two solid marks on the week at the Alex Wilson Invitational. The distance medley relay squad posted an 11:01.19 which is good for fifth in the nation, while the 4×400 relay team came in at 3:33.53, currently 12th on the Descending Order List. The NCAA Division I Indoor Track & Field Championships will take place on March 9-10 at College Station, Texas.